Co-founder of Yoga Studio Barcelona. 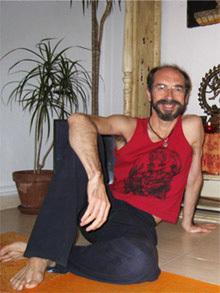 A psychologist and tireless seeker of the truth, Xavier has been a yoga teacher for more than 20 years. He learned and lived alongside Suamis, disciples of the spiritual master Suami Vishnu Devananda, during a golden period for the study of the traditional teachings of yoga. After teaching at a number of different centres, in 2001 Xavier, together with Pilar Ruberte, created their centre in Barcelona, aimed at people seeking to rediscover peace and connect with their inner selves through the practice of yoga.